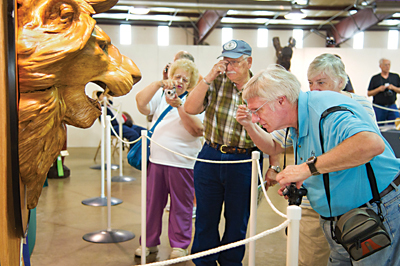 The 47th Annual International Woodcarvers' Congress, held in Maquoketa, Iowa, this June drew woodcarvers, exhibitors, as well as patrons of woodcarvers and their families, from across the United States, Canada and overseas, almost doubling the little town's population - and for good reason. 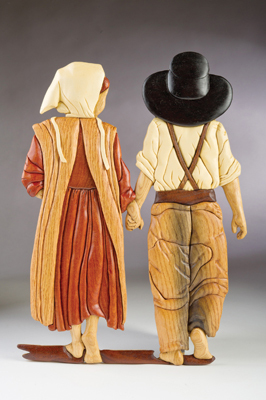 The Affiliated Wood Carvers, Ltd. (AWC), responsible for all aspects of the Congress, is known as one of the hardest-working, most passionate groups of the international woodcarving community. 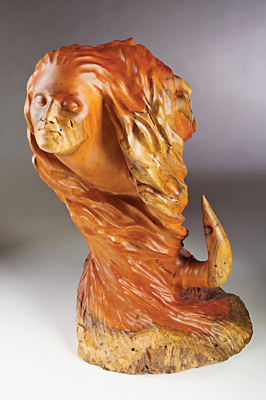 Consequently, the Congress, now in its 47th year, has reached the status of being the most prestigious, longest-running, competitively judged woodcarving art show in the world. 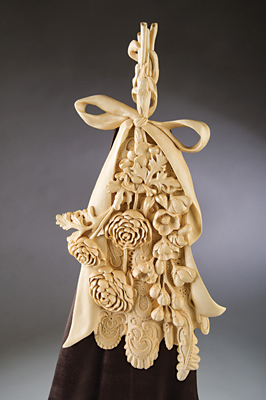 The AWC provides, to both those who exhibit their work competitively, and to those carvers whose primary goal is education, one of the best carving experiences in the USA - the Congress. In 2013, The AWC worked diligently to accommodate those artists who wished to enter competition pieces. To assure artists their pieces would be judged against similar works of art, the AWC provided over 90 separately judged categories. 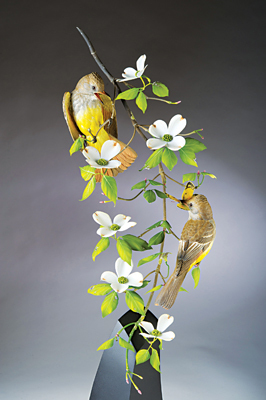 To make it as convenient as possible for artists to enter their pieces, the AWC accepted mailed-in competition pieces, or allowed pieces to be brought to the Congress up until two days prior to the competition, rather than just a few hours the day before the judging began. To reassure exhibitors that their pieces were given full and sufficient attention, each of the Congress judges devoted two full days to review and consider all the competition pieces before choosing the winners of each category. Awards and prizes for the 47th Congress exceeded $17,000. 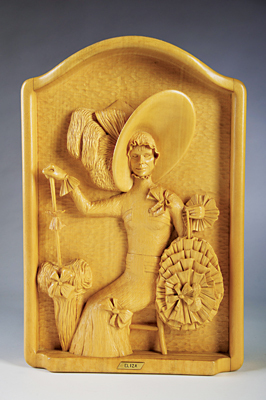 The returning competitor who travelled the greatest distance was Peter Paces from Surrey, who took 3rd place in the relief category for his Eliza Doolittle carving. To attract new individuals to the art of woodcarving, the AWC included judging categories such as 'Young Carvers', 'Instructor Assisted' and 'Carving from a Rough Out'. All Congress judges are chosen because they are experts in their specific carving field. 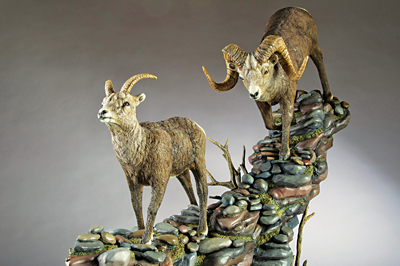 The professional judging team for the 47th Congress consisted of Linda Curtis from Marion, Iowa, who specialises in realistic wildlife; Randy Landen from Derby, Kansas, a member of the elite Caricature Carvers of America; and Neil Cox from Ingersoll, Ontario, who specialises primarily in figurative and often allegorical styles. The judges awarded 2013 Best of Show to Fred Cogelow from Willmar, Minnesota, for 'Questions & Answers Equally, Profound'; Best of Show First Runner-Up to Josh Guge, Gilberts, Illinois, for 'Butterfly Catchers'; and Best of Show Second Runner-Up to Terry Brasher, Petersburg, Tennessee, for 'White Buffalo'. The Judges Choice Awards were awarded as follows: Linda Curtis chose Debra Bergum, Lakeview, Arizona, for 'Flowers on Lace'; Neil Cox chose Chris Howard, Gatlinburg, Tennessee, for 'Spirit Land'; Randy Landen chose Chris Hammack, Stephenville, Texas, for "The Brawl'. At the end of the week, the judges held a critique session where each judge explained why specific carvings won blue ribbons, while providing opinions on how other carvings could have been improved. After the critique, the judges were available to any carver who wished to speak to them privately. It was a rare opportunity for carvers to receive expert advice and support. 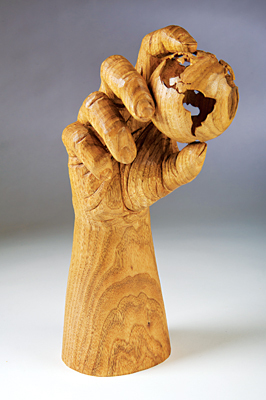 While there were over 500 competition entries, not all Congress attendees came to exhibit their carvings â€“ they arrived with the primary goal of education. The AWC, meticulously attentive to this group of individuals, put together Congress Week - a smorgasbord of seminars during the week prior to competition judging. For the week, attendees could mix and match from seven five-day classes, five two-day classes, six three-day classes or three one-day classes, all taught by world-class tutors. The cost for the seminars was a reasonable $45 per day, plus instructor-supplied materials. 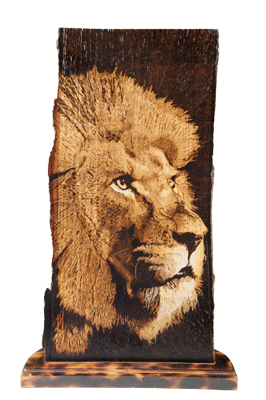 The seminars covered a range of carving subjects including Architectural-Ornamental, Faces in Relief, Realistic Animals, Cottonwood Bark, Realistic House, Carolina or Winter Wren, Air Brushing, Unusual Woods, Mountain Man and Native American Masks, Caricatures, Whittling Little Folk, Intaglio Relief, Design and Composition, Cottonwood Ornaments and Pyrography. Friday of Congress Week, a surprise visit was made by nationally and internationally renowned and acclaimed artist, Rose Frantzen. One of her projects, Portrait of Maquoketa, consisting of 180 Maquoketa residents' portraits, was recently shown at the Smithsonian's National Portrait Gallery in Washington, D.C. Rose, impressed with the energy of tutor Vic Hood, set up her easel just outside his door and painted Vic teaching his class. The oil painting currently has a home in Rose's studio. The AWC was well aware that carvers attending the Congress were often accompanied by family members who were not involved with carving. Wanting to satisfy those family members, the AWC offered several one-day craftS classes. If a carver had forgotten to bring a gouge, needed a new knife or just wanted to browse to see what was new in carving equipment or books, The Woodcraft Shop and Belcher Carving Supplies brought an extensive range of tools, books, magazines and supplies to the Congress. Should a tool require sharpening because it had turned dull, or been accidentally dropped on the concrete floor, sharpening services were available from Belcher Carving Supplies for $2 a tool. The AWC knew that attendees' muscles might need a little TLC after carving for eight hours a day for six consecutive days, and had a professional massage therapist available on the premises, offering 15- and 30-minute massages. Whether a carver came to the Congress as an exhibitor, or for the carving seminars, a common denominator - besides wood and tools - was food. Throughout the week, the staff at the Jackson County Fairgrounds provided warm and cold lunch entrees, on site, with most under $5, along with coffee, tea, soda and ice cream. On the Saturday night, at the Annual Awards Banquet, competition awards and prizes were announced. In addition, attendees had an opportunity to exhibit those pieces they had created at their seminars during Congress Week. On the Sunday afternoon, the AWC held a Silent Auction in the competition showroom with all proceeds used to support the Congress. 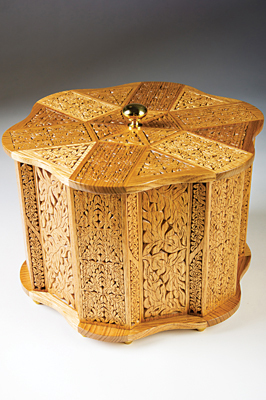 The Judges for the 48th Annual International Woodcarvers' Congress have already been chosen. 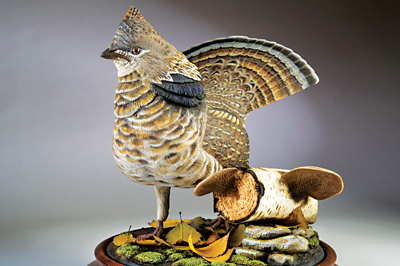 They are Fred Cogelow from Willmar, Minnesota, winner of more than 12 Congress Best of Shows; Josh Guge from Gilberts, Illinois, a consistent Best of Show winner in the world of fish carving and expert bird carver and painter; and Peter Benson from Essex, England, whose expertise lies in carving netsuke and teaching carving. 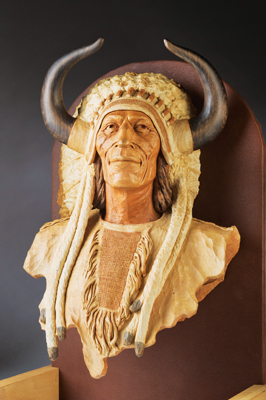 To take part in one of the best carving experiences in the USA, provided by people who understand the needs and joys of the woodcarver, highlight 8-14 June, 2014 on your calendar.